Within a month, I started seeing a line out the door. It went down the block, and the wait often exceeded an hour. 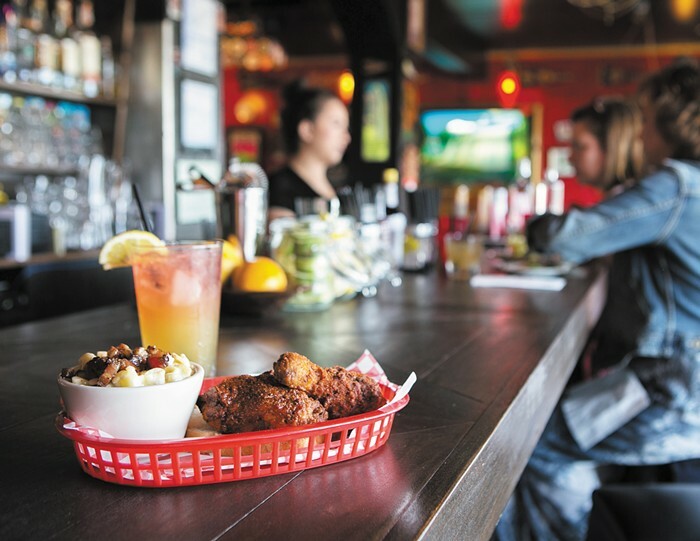 The hot chicken is the draw, but this place isn't a one-trick pony. In May, I devoured a fantastic iceberg wedge salad made with house-smoked bacon, lots of fresh tarragon, and two of spring's best items: sweet English peas and peppery radishes. Don't be fooled—the place may look like a red-walled dive bar, but chefs Chris Barton and Chris Howell are cranking out restaurant-quality food. Also, the beer is ice cold and comes in cans. Long menus make me suspicious. How can you be good at something if you're trying to do everything? This is why I love the restaurants Monica Dimas has created. Dimas owns three Capitol Hill eateries—Neon Taco, Tortas Condesa, and Sunset Fried Chicken Sandwiches—each with its own specialty food item offered with a few small but meaningful variations. By focusing and nerding out on specific food items—fresh corn tortillas, house-made cumin-rich chorizo, fried chicken made from moist, dark thigh meat—Dimas showcases both her Mexican heritage and the technical skills she picked up working at some of the city's best restaurants. For all three of her projects, Dimas shares space and business ties with Rachel Marshall and Kate Opatz, who own the bars Nacho Borracho, where Neon Taco is located, and Montana, next door to Tortas Condesa. (Marshall also owns Rachel's Ginger Beer, and Sunset Fried Chicken Sandwiches, which opened in May, is a walk-up counter housed inside its Capitol Hill location.) I'd always assumed that Dimas worked with Marshall and Opatz because the arrangement allowed her to keep the operational costs lower than those of typical restaurants. But when I asked her, her response had more to do with the support and synergy that comes from real, personal relationships. "[The operating model] just lets us focus on what we do best," Dimas said. "The scale/operating costs are not part of why I do it—we just work well together. There's more to it than just having someone take over a kitchen." Kristi Brown-Wokoma cooked at Capitol Hill's dearly departed Kingfish Cafe when it rose to prominence in the 1990s. But restaurant kitchen hours, which run late, are at odds with raising a child, so she decided to work in catering. Brown-Wokoma built her own culinary business, That Brown Girl Cooks, through catering and selling her signature black-eyed-pea hummus at grocery stores. In late February, Brown-Wokoma found her way back into a restaurant kitchen, but still very much on her own terms. For a week, she took over the Central District's Bannister with her lunch pop-up, Holy Water. On tables covered in Dutch Wax fabric, her grown son served up bowls of his mother's riotously flavorful food: lettuce cups filled with millet, fiery Laotian pork sausage, and spicy sour mango; slow-roasted Trinidadian goat curry over coconut rice; and an ultra-rich mushroom soup that, true to the menu description, was indeed a "silky bath of garlic cream heaven." By doing a lunch pop-up, Brown-Wokoma tapped into an altogether different energy that was a pleasure to see and be part of. Holy Water was a sunny respite and midday treat for workers, as well as a welcoming space where everyone was treated like friends and family. A fair amount of my time and energy as a food writer is spent tracking restaurant openings and keeping an eye on the "hottest" places. People will always be interested in the newest restaurants, but just as important are the restaurants that are built to last—places where, as the silverware slowly dulls over time, the food and spirit continue to shine. I spend many hours writing about places that I might never visit more than three times—and barely any time writing about the restaurants and food that truly nourish me. The best restaurants are the ones that you find yourself returning to again and again, for the dishes that you never tire of eating and the people who make eating there a pleasure. For me, Beacon Hill's Bar del Corso is that place. Within five minutes, and without thinking, I always have a Negroni in my hand, and the salad of chicories—tender leaves of escarole, speckled Castelfranco radicchio, and frisee under a mountain of shaved grana—on the way. The first bite, lit up by a bracing anchovy vinaigrette, never ceases to amaze me. Bar del Corso's small, focused menu features beautiful wood-fired pizzas (order the Romana, and be sure to add the buffalo mozzarella). But, even after five years of serving countless pizzas, fried risotto balls, and plates of creamy burrata, chef Jerry Corso's menu always remains fresh and, yes, new. A small chalkboard menu displays daily, often seasonal, specials: a pizza with roasted spring onions and prosciutto, rich and salty bacalao with grilled bread, or a light and simple vineyard worker's stew with fava beans, English peas, wee artichokes, and mint that I ate this past April. Just like spring, the dish was bright, vibrant, and quietly exhilarating. It moved me—but not as much as owner Gina Tolentino Corso did earlier when she picked up my daughter as though she were her own and placed her in a high chair to eat her fill of fava beans and pizza.